Nonsuch and Wallington students attended a conference together on Russian History. Below are some reports about their views on the speakers and their research. What do you think? Do you agree with their reviews? On 22nd November, the sixth form History students attended a ‘History In Action’ conference on 20th century Russia, and were given the opportunity to learn the perception and evaluation of several reputable historians. The final historian to speak was Orlando Figes - an award winning writer and professor at Birkbeck College, University of London - who gave a lecture that encapsulated the period from the February Revolution to the Civil War. Surprisingly, considering that each historian was only given half an hour to cover a complicated period of history, Figes’ session began with a lengthy piece of self-promotion about his books and website. After the “short” diversion from the topic of lecture, Figes went into great depth about the main historical events within his given time period. His chosen form of explanation were through historical sources, which can be deemed a success, given that source analysis features heavily in the a-level history exam. Much of the expert knowledge Figes imparted to the audience was taken with interest. Perhaps the most insightful aspect was his analysis of the causes of the February Revolution and the Civil War; much of his focus was on the influence of violence. One reason for the revolution that Figes outlined was the fact that the majority of Serfs remained under the control of gentry and magnates, despite their supposed emancipation. A cause of the Civil war was Lenin’s drastic approach to change, including the introduction of equal citizenship and the immediate transfer of power to the proletariat, all of which worked to destroy the bourgeoisie. Overall, the lecture did offer some valuable knowledge for use in A-levels, although Figes’ main message seemed to be: if students hope to understand Russia’s revolutionary history, they should use his website and, most importantly, pay the subscription. This lecture by Dr Zoe Knox was considering whether Bolshevism could be considered a religion. She outlined how the Bolsheviks feared traditional Russian Orthodoxy, as it was seen to be a rival belief system with a conflicting ideology. Not only this, but religion was a major impediment to the establishment of Communist authority in the countryside, as the Orthodox Church had long had considerable control over the lives of villagers, as it was the many religious festivals and events that controlled the village calendar. Back then religion was a way of life and in Russia the religion that dominated was Christianity. When the Bolsheviks came to power there was among them the very real fear that the Church had the ability to wield more power and authority over the people. Dr Knox touched upon the fact that the Russian Orthodox Church had always been a powerful tool of the Russian monarchy, with the Church encouraging people to follow the tsar to a fault. The Church preached that Tsar Nicholas II was their “little father” appointed over them by God himself. Despite the Bolshevik contempt of religion, there is much evidence to suggest that not only did they want to eradicate Russian Orthodoxy, but they attempted to create their own kind of rival religion. 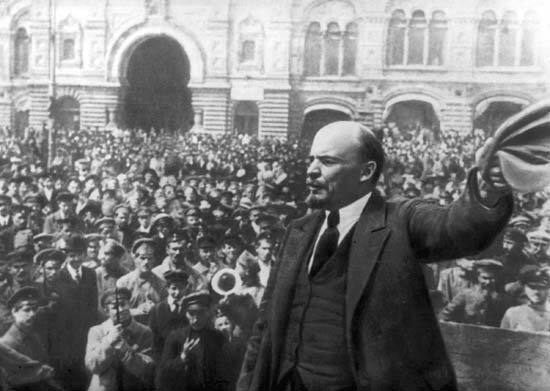 Knox points to the posthumous cult of personality created around Lenin that resulted in him becoming a revered, god-like figure, with his dead body in Red Square becoming a pilgrimage site much to the disapproval and despair of Lenin’s wife. Dr Knox also described the many secular festivals and traditions created by the Communists to undermine the traditional religious ones, an example being the Soviet New Year. this particular festival was a poignant dig at the orthodox church as it marked and celebrated the change from the Julian calendar which has been used by the church for centuries to the Gregorian calendar. We enjoyed Dr Zoe Knox’s lecture, as she posed new questions and brought new ideas that we had not previously heard. As well as this we especially appreciated the way she separately analysed the cult of Lenin and Stalin. However we would have liked to see more evidence as to whether Bolshevism actually managed to replace religion especially in the countryside where the Church had been its strongest. Furthermore, she did not come to a conclusion deciding whether she thought Bolshevism could be seen as a religion or not and we would have liked to seen her own opinion. On the 22nd of November at a conference at UCL, we had the privilege to see several lecturers, including Jan Palmer, who spoke about Communist Russia during the 1900s. Palmer focused on the Stalin era and the role he took as a dictator. The speaker mentioned the steps Stalin took through his rule including his return to traditional values, the ‘Great Terror’ in 1937 and the ‘Stalin cult’ that emerged in support of the leader in 1929 and continued throughout the 1930s. For example, he explained that Stalin carried out highly publicised show trials in attempt to cause fear upon potential enemies and recriminalised homosexuality in 1933 and abortion in 1936 to attempt to return to these more ‘traditional’ values. Furthermore, Palmer spoke about the ‘Great Patriotic War’, discussing Russia’s involvement in the Second World War from 1941 until 1945 and how the victory is still a unifying story of Russia to this day. Additionally, Palmer broke down various aspects of the Stalin era such as the five-year plans and included an overview of communism in the USSR from the 50s to the 90s and linked it to other political climates at the time such as the fascist dictatorship in Spain. Palmer also discussed how the Stalin era affected society in more unexpected ways, for example art changed from the Avant Garde and dynamic style of the futurists which had promised change and hope to the more traditional realism. Overall, the lecture was enjoyable as his talk was engaging and Palmer successfully presented an overview of Stalin’s time in power. Furthermore, the presentation used appeared to be well thought through as it had extra context which Palmer didn’t have time to cover and images which aided our understanding of the information we were being taught. However, to improve the lecture, the speaker could have gone into more depth about specific areas of the Stalin era as the short time given for each lecture did leave us wishing for more details on certain topics he discussed. Moreover, Palmer presented us with a reasonably thorough and very engaging overview of the Stalin era which introduced us to a range of topics we could later research ourselves. During November we had the opportunity to visit UCL for the day to enjoy a Russian history course in which various knowledgable speakers and historians spoke about their findings of Tsarist and Communist Russia. Professor Dominik Lieven spoke about the Russian monarchy and its challenges and failure. Lieven stated that with the empire being so diverse and large, one person leading the country autocratically was doomed to fail. The Tsar faced problems of popular sovereignty and compared to Britain and France. Russia was very backwards- property was less secure, there were less literate people and a smaller middle class. Additionally Lieven expressed his view that pre-modern Russia was very successful and no other empire had been faced in such harsh geographical context yet still achieved thorough autocracy. After the monarchy had almost collapsed in 1905 after a great economic slump and losing the Russo-Japanese war, people of Russia had already began to see the weaknesses of the Tsar. The professor also showed us that during 1905-14 there was a constitutional monarchy and the government was expanding, becoming more complicated and unpopular. When revolution came in 1917 nobody was prepared to defend the in Lieven’s words a ‘shy, untrustworthy and uninterested in politics’ Tsar, this was because the people of Russia had lost confidence in him and were unwilling to start a civil war in defence for a monarch who they thought was incapable of ruling such a large empire. Overall Lieven gave an engaging and articulate lecture on the Russian Empire leading up to the revolution. He highlighted the strengths of the Russian monarchy which we would have normally overlooked, and how autocracy actually did benefit the people of Russia to a certain extent. This was very interesting as in class we mainly look at how the monarchy failed the Russian people and essentially caused its own demise. To improve the lecture, Lieven could have included a powerpoint to list down the key points that he had.